After months of raising FunnyKid, middle-of-the-night feedings, kisses for bumped foreheads and more diaper changes than I can count, what finally earned me the title of parent? This. The Pretend Husband and I had been patting ourselves on the back that we had finished Christmas shopping for FunnyKid and hadn't gone overboard. 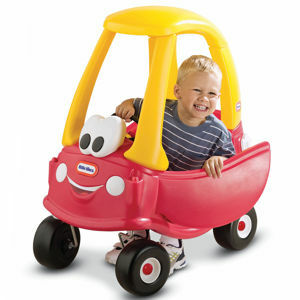 We had discussed getting him a Cozy Coupe, but figured we could get it for his birthday next summer. Then, while picking up some groceries at a warehouse club the other night, we spotted it. And it was cheaper than we had seen it anywhere else. And, despite my fears that having one more big gift under the tree will turn my sweet boy into a spoiled brat, we bought it. And then I tried to assemble it. Pulling the large plastic pieces out of the box at 10 p.m., I thought, "how hard can this be?" Ha! Picture me two hours later, sweating and cursing because I'm still not finished and it's impossible to tell from the drawings which part is pictured and how does this thing fit? I had to view on-line video instructions and pull out a drill in order to get most of the way done. It was after midnight, and long after the PH had gone to bed, when I got to the part of the instructions where you need two people to finish the stupid thing. That's when I abandoned the project and went to bed, knowing I still have a couple of days to get it done. FunnyKid is going to LOVE the cozy coupe and I know that seeing the joy on his face is going to erase any dark memories I have of putting the stupid thing together, but remind me next year to start assembling his gifts well before Christmas Eve because they are never as easy to assemble as they look. Oh, and when you remind me, call me "Mom." I've earned it. We're all familiar with my love of couponing, my insistence I get the best deal and a sense of competition I don't necessarily leave on the soccer field when the game is over, right? Well, I would hereby like to welcome myself to the frenzy known as "Parents Go Insane Trying To Get The Most Popular Toys For Their Precious Wittle Wonderful Ones (2011)." And if you think having a 15-month-old means I'm not vying for the really serious electronic stuff, let me remind you that I am a very popular aunt and intend to remain that way. Hence, there have been some late night eBay sessions in which I put all my super secret skills to work (if the bids are climbing by 25-cent increments, I'm not above having my high bid end in .34. Oh wait, everyone does that? It's a not-so-secret strategy? Nevermind then.) And while I haven't stooped so low that I've pulled the pepper spray out of my purse and gone crazy on my competitors (uh, I mean "fellow shoppers"), I'm not above whispered conversations on my cell phone to confirm I just spotted *the* hottest toy of the season ("there's four of them. Should I buy all four?") (I didn't buy all four-- I let some old guy who claimed it was for his grandkids get in on the action). And this is just the beginning. I have a kid at the age where he would love climbing into the box the toy came in as much as playing with the toy itself (if not more-- boxes are a big draw around here). Can you imagine what I'll be like when I'm doing it for real and the stakes are having a disappointed child shouting that he hates me on Christmas Day because I didn't get him whatever toy he and every other child in the United States wanted? Yeah, I'm kind of scared of me too.